Canadian Startup Business Resources | Mentor Works Ltd. Most Canadian government funding programs are targeted towards small to mid-sized enterprises, which generally excludes entrepreneurs and young startup businesses. Fortunately, there are other resources available to help startups build a foundation for growth and success. Startups and small businesses that asks Mentor Works about government funding programs can typically receive better startup-oriented support from other organizations. By accessing these resources, startups will be well on their way to receiving their first government funding grant or loan. The full suite of Ontario Network of Entrepreneurs (ONE) programs and services can be accessed by contacting one of the 17 Regional Innovation Centres (RICs). These resources are available to entrepreneurs and young companies looking to start, grow, and finance their ideas. Staff at these RICs include entrepreneurs-in-residence, specialists and analysts with years of business experience who are well-positioned to deliver ONE programs and services. Please visit ONE’s website and fill out the form on their homepage to locate your nearest RIC; they will provide you with your local RIC’s contact information. Futurpreneur Canada is a business support service that has been fueling the entrepreneurial passions of Canada’s young enterprise for nearly two decades. They are the only national, non-proﬁt organization that provides ﬁnancing ($15,000 + $30,000 from BDC), mentoring and support tools to aspiring business owners aged 18-39. Employment Ontario has Employment Services Centres across the province, who provide employment subsidies, matchmaking, and other HR resources to Ontario businesses directly, including the wage subsidies, training initiatives, and grants to support hiring summer students. To get started, please identify and contact your local Employment Services Centre via the Find Employment & Training Services link on the Employment Ontario homepage. Mentor Works provides occasional updates on the startup funding landscape through our blog. 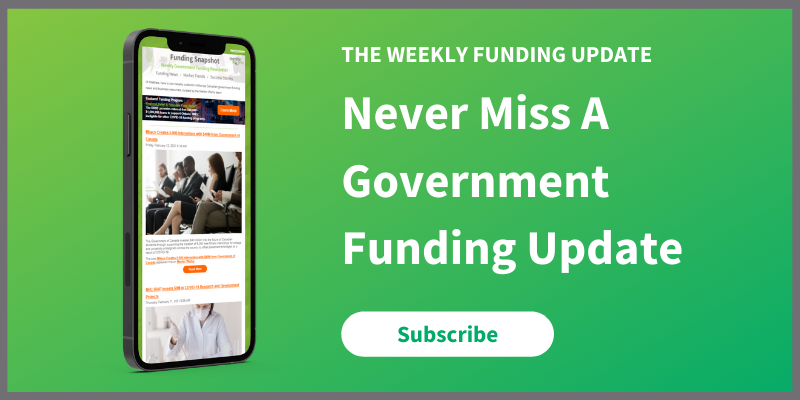 Whether sharing news of upcoming startup events or funding programs aimed at early-stage businesses, you can find details of funding opportunities by registering for our weekly Government Funding Snapshot newsletter. Each Monday, you’ll receive top funding news from the previous week; while not all editions will feature startup-related news, you’ll have access to our full range of business consulting, market trends, and professional development news. You’ll also gain an insider’s perspective on the government funding landscape for mature established businesses, which can assist with your business’ growth and development as it prepares to access grants and loans into the future.